What would you do with an extra day off? This is the inspiration behind Zappos’ #TakeTheLeap campaign, an initiative to turn Leap Day into a national paid holiday. Hosted on Change.org and a dedicated Zappos website, the company offers some compelling reasons for its position. 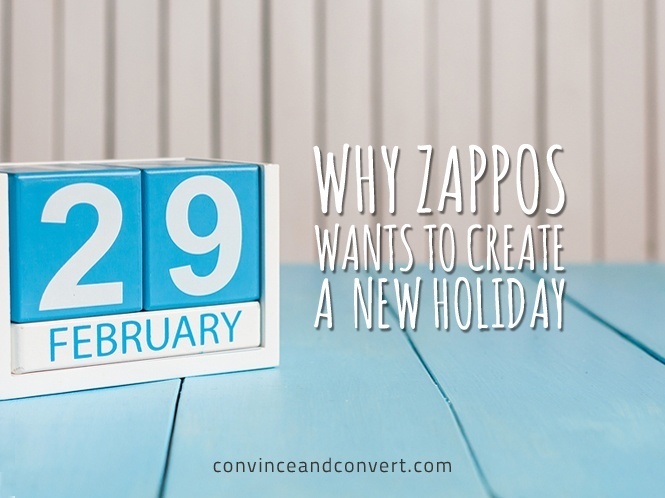 Zappos celebrated Leap Day by giving all 1,600 employees the day off as a paid holiday and encouraged them to #TakeTheLeap and cross an item off of their bucket list. Watch as CEO Tony Hsieh tells employees that they will all have Leap Day off and inspires them to think about how they want to spend their day. Then, Zappos took it a step further and documented how its employees checked off their Leap Day bucket list items. While it could seem far-fetched for a company like Zappos to embark on an initiative like this, the company is essentially leading by example. CEO Tony Hsieh could easily decide to give all Zappos employees every Leap Year off, but why not inspire other leaders and companies in the process? Zappos is celebrated for its exceptional culture, and examples like this can further inspire its customers, current and future employees, and other executives. It’s important to note that part of what makes this initiative so compelling is how Zappos brought the story and mission of #TakeTheLeap to life. From leveraging Change.org to a dedicated microsite with stats on how many extra hours we’re working in a Leap Year or our lifetime, there’s a clearly defined argument for the cause. However, while facts and figures add credibility, what really hits the point home are the real stories from Zappos employees. Stories are highly relatable and tap into our emotions, making them much more memorable. Add in an inspiring video featuring Zappos employees completing their bucket list items, and it’s easy to see how the company could start a movement where customers and employees join together to #TakeTheLeap. Will the President and Congress agree? While that’s up for debate, it’s hard to fault Zappos for trying. To learn more and sign Zappos’ petition, visit Change.org.